Protests in Istanbul rage on after police violence transformed an occupation by a handful of activists in a public park into massive anti-government demonstrations around the country. The occupation of Gezi Park, located in Istanbul’s central Taksim Square, was initially spurred on by government plans to develop a shopping mall over the park, one of the last remaining green spaces in the sprawling metropolis. Media outside of Turkey wrongly characterized this as a tree-hugging environmental protest, rather than a battle over the nature of urban space. After the protests became world news, Western media got it wrong again by characterizing the uproar as a revolt against Islamic influence in Turkish politics. For The New York Times, Tim Arango frames the protests as a fight over the country’s identity as Islamic or secular. And the BBC aired a segment portraying the growing movement as a secular revolt against Islamic rule, falsely claiming that 50 percent of the Turkish public is Islamist. The latter claim is a reference to the fact that Prime Minister Recep Tayyip Erdogan’s ruling Justice and Development Party (AKP) received nearly 50 percent of the popular vote in the 2011 general elections. But it overlooks the fact that support for the AKP came from many sectors of society, not just devout Muslims. This view is confirmed by the opinions of protesters on the ground. “Saying the protest is about secularism or religion misses the point completely,” says Zeyno Üstün, a demonstrator who participated in the occupation of Gezi Park on the very first night, May 27. Üstün was one of only fifty activists who occupied Gezi Park on the 27th. Now the movement she helped launch has been taken up by hundreds of thousands. The protests have in the past days manifested as general anti-government protests, transcending the original focus on public space in Istanbul. With every tear gas canister launched by police, demonstrators’ beliefs that the Turkish government is drunk on power are verified. “Demonstrators numbers have grown exponentially as the police violence escalates,” Elif Ince, a reporter for the Turkish daily Radikal, told The Nation. Ince is an intrepid reporter who has been covering urban transformation and gentrification in Istanbul for three years. She reported from the protests beginning on May 27, expecting it to be yet another small-scale action, and has now seen them explode onto the world stage. 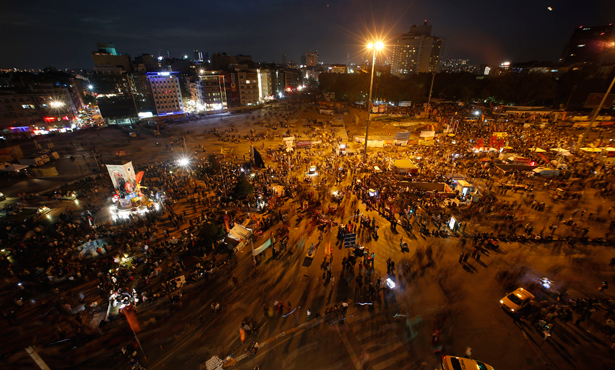 This is the thread that ties the movement together, from Gezi Park to the rest of the country. The Turkish people are demanding to have control over how they live their everyday lives. The uprising was quickly cast as a revolt against Islamism largely because of media sensationalism around Erdogan’s recent restrictions on the sale of alcohol. But the response to the alcohol regulations needs to be viewed in the light of the Turkish people’s cry for self-determination. Erdogan himself has said that he does not oppose Turkish citizens drinking in their own homes; it is only the public consumption of alcohol that he finds problematic. To wit, the fact that pious Muslims are taking part in the uprising demolishes Erdogan’s boast that he could bring half the country out into the streets if he wanted. In particular, groups such as Revolutionary Muslims and Anticapitalist Muslims that blend Islamic thought with leftist politics have been active participants thus far. This fact highlights the most remarkable aspect of the movement: its coalitional nature and broad appeal. Within the space of the demonstrations, many of the traditional barriers in Turkish society no longer seem to apply. People chant slogans in Kurdish and wave LGBT rainbow flags as expressions of their individual identities. Erdogan and his AKP were once praised as a democratizing force in Turkish society. Turkey’s National Security Council, established after a military coup in 1960, was for five decades de facto empowered to set the agenda for Turkish politics. Its role stemmed from the military’s self-understanding as the “guardians of the secular Turkish Republic,” vowing to defend against any anachronistic encroachments of Turkey’s Islamic Ottoman past. When in 2010 Erdogan refused take orders from the National Security Council, pro-democracy liberals—most of them secular—supported the move. These liberals tired of chafing at the anti-democratic nature of the military and its support of coup attempts through the Turkish Deep State, a shadowy network of secular-nationalist power brokers spanning the intelligence apparatus, high-level military leaders, the judiciary, and organized crime. But that well-rehearsed posturing of the once-charismatic prime minister no longer has the traction it once did. It has now become apparent that AKP’s demilitarization of society was not for the sake of democracy, but in order to consolidate Erdogan’s own power. Many of those demonstrating today no doubt applauded Turkey’s growing democracy when the AKP brought the military fully under civilian control. Now they are demanding yet more democracy. But the streets themselves are far from any utopia. Although for the most part different sectors of Turkish society have been able to coexist peacefully at rallies, that is not always the case. Emre Sahin, a young Kurdish activist told The Nation about one incident in which demonstrators turned on each other. While Sahin was marching in the bloc of the pro-Kurdish rights Peace and Democracy Party (BDP), some members of group carrying Turkish flags began throwing stones at the BDP bloc. “BDP youngsters were provoked and responded the same way,” Sahin said. Shortly thereafter, older members of each group brought the violence to a halt. But the message was clear: Kurds are welcome to protest, so long as they don’t protest for Kurdish rights. What remains to be seen now is how this movement continues to evolve. Kemalists—followers of the secular-nationalist ideology inspired by and named for Atatürk—like the ones who throw stones at Kurds would certainly welcome military intervention, even at the expense of democracy. So the protests can either remain open to and accepting of all, or they can induce a refrain of Turkey’s hardline secular and nationalistic past. Read Allison Kilkenny on the international solidarity with Turkey’s uprising.